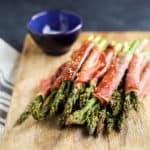 Wrap two stalks of asparagus with one slice of prosciutto. Repeat until everything is used up. Place prepared asparagus on baking sheet. Drizzle with olive oil and sprinkle with sea salt. Remove from baking sheet and garnish with fresh lemon zest.